HOW OFTEN DO I NEED VENT CLEANING DONE? Most homes should schedule furnace and vent cleaning every 3-5 years. Homeowners with small children, pets, or occupants with asthma, allergies, respiratory, or autoimmune issues should consider more frequent cleaning. WHY HAVE VENT CLEANING DONE FOR MY DRYER? Over time, dryer vents get clogged up with lint and prevent the heat from venting to the outside. Dryer vent cleaning should be done annually from the dryer to the outside vent hood in order to prevent this overheating, which could cause dryer damage or even a major house fire. SHOULD NEW HOMES HAVE THEIR VENTS CLEANED? Yes, the duct systems in brand new homes are already contaminated with construction debris and drywall dust caused by running the system during construction. This dust should be removed to optimize system operation and minimize dust circulating throughout the home. WHY DO YOU HAVE TO CUT HOLES IN THE DUCTWORK? Normally we have to cut into the ductwork in order to attach a large HEPA vacuum to the duct system, and also to insert our cleaning tools into the ducts to loosen and remove the debris. All access holes will be properly sealed to prevent leakage and ensure no loss of performance. 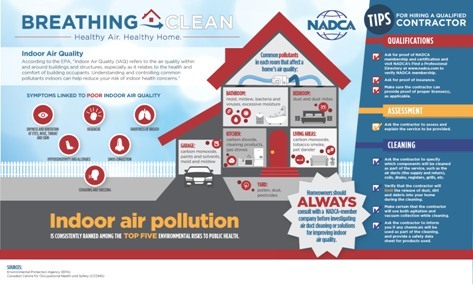 Learn more about NADCA (National Air Duct Cleaning Association) process. WHY DO SOME COMPANIES CHARGE SO MUCH LESS? WE GET COUPONS FOR $59.00? Not all companies use NADCA-certified procedures, taking many short-cuts and giving a poor quality job using inadequate equipment. Some unscrupulous companies try to entice you with ridiculously low prices; then they add in the extras once they arrive at your house. They could even try to scare you by falsely claiming you have a mold problem, requiring major expense. Click here to learn more and watch WBAL video! HOW DO THE DUCT CLEANING SCAMS WORK? Scammers begin by promising you a complete job at a ridiculously low price. Once they show up they inform you that your job will cost much more due to various factors; often they will tell you your system is contaminated with mold, when actually it is just normal dirt. They will charge you whatever they feel they can get away with, then often they still do not even do the work properly. Click here to learn more and watch WBAL video! WHAT CAN I DO IF I FEEL THAT I HAVE ALREADY BEEN SCAMMED? If you feel that you have been overcharged for a poorly done job, you should contact a NADCA-certified company and explain the situation. We will, for a nominal charge, inspect your system to see if the work was properly done; if you choose us to re-do the work, we will then give you a credit off the final bill. We have even photo-documented shoddy work to help the customers get refunds from the original company.